An unexpected sunny day. Can’t sit still, can’t stay in. Time to go exploring. All I really want is to be outside, in the sunlight, moving around. I went up on the ridge behind my house, where there’s another little neighborhood. Followed a new paved road, and parked next to a real estate sign. I didn’t see any signs that said No Trespassing, so I just headed out across the slope. The area was recently logged. The ground is gentle, and I could see from the marks on the stumps that they used one of those feller-buncher machines (my logger brother calls them “The Enemy”). 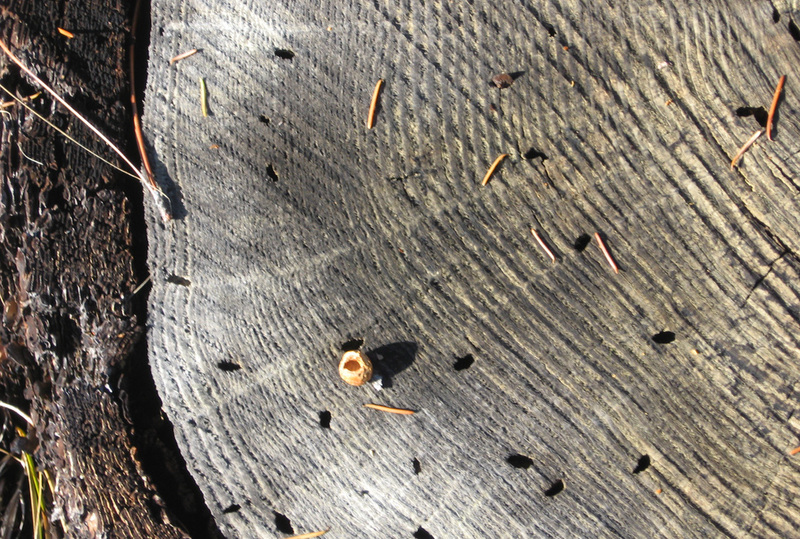 Wood borers have worked on this stump already, and the chewed filbert nut indicates that a squirrel has used it for a dining room. Continuing across the slope, there are more signs of logging and dining. 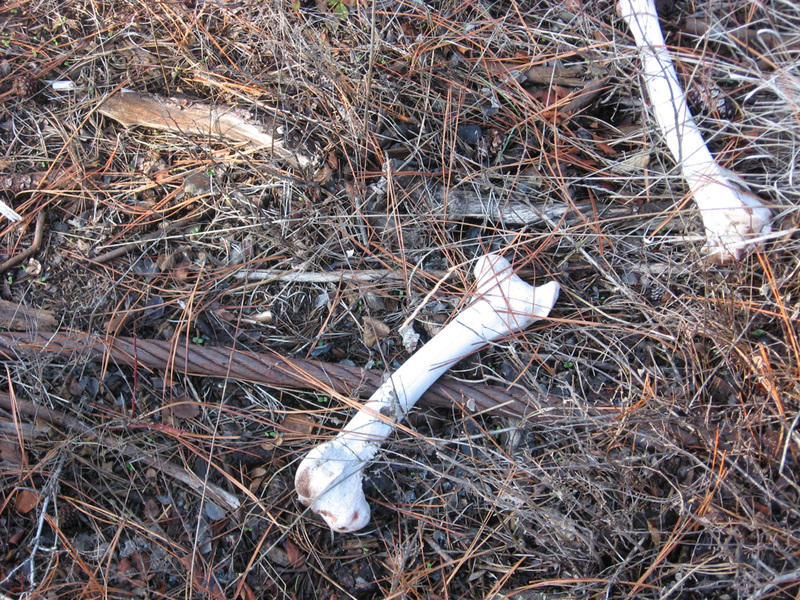 This deer’s skeleton is all together in a fairly small area, which means it probably died there and was not carried away by scavengers. Could have been a cougar kill, I suppose. What is so startling about sunlight after many gray days is the intensity–even in late November. I am struck by the crispness of the light and shadows. 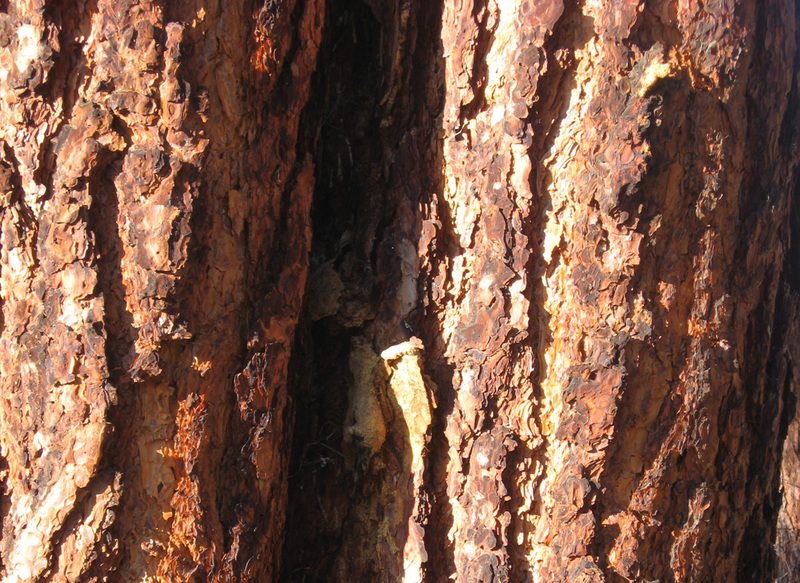 The warm color of ponderosa pine bark pulls me in to admire the texture. This tree was scarred on one side, and the tree has grown around the original injury. 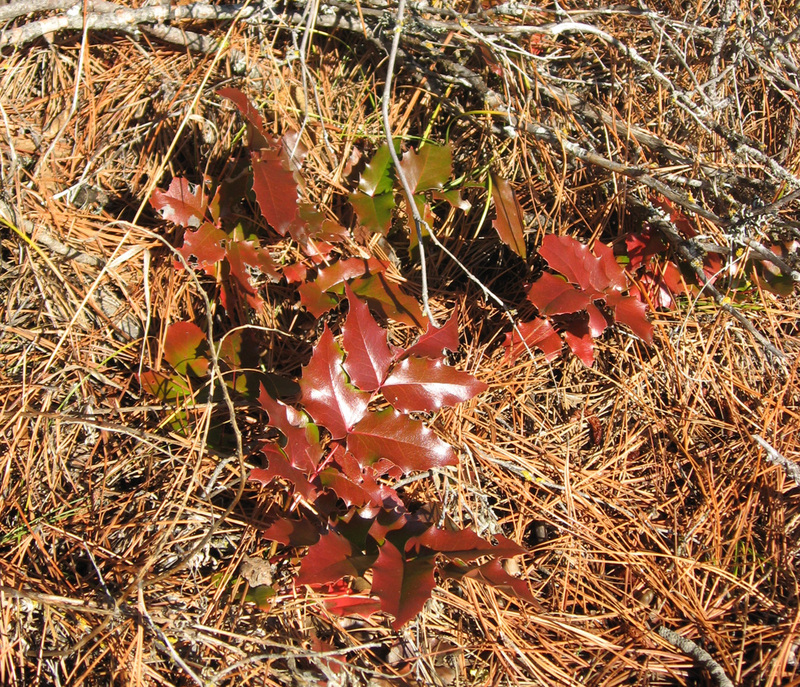 The oregon grape leaves have also turned a warm color. The leaves are so shiny that they reflect nearly white in the bright sun. The shininess of the leaves helps them tolerate long periods without water. It’s hard to get away from the sound of Interstate 90. Traffic noise is nearly constant in Cle Elum. Since this is the day after Thanksgiving, many travelers are returning home and the vehicles are constant. The wind is also blowing through the trees, so I can almost convince myself that the freeway sounds are the wind or a river. 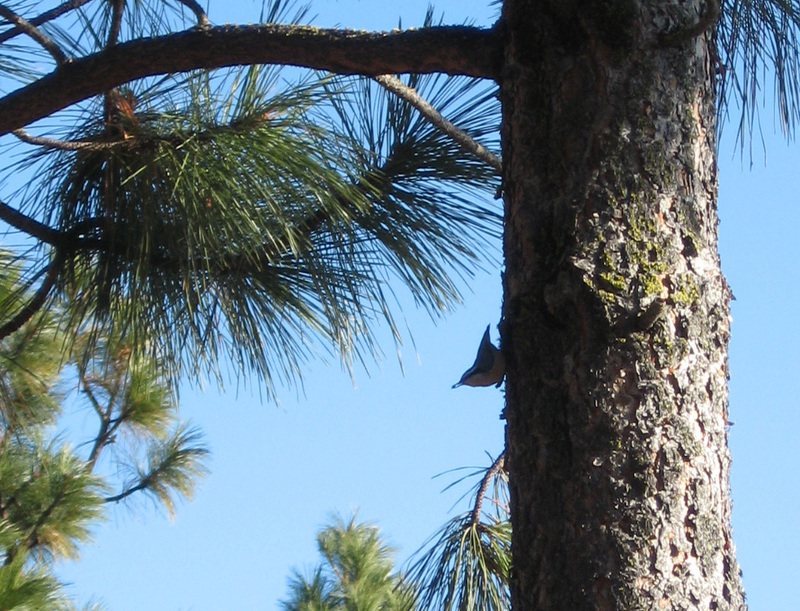 My ears are glad to latch onto specific sounds, like nuthatches working their way headfirst down the pines, looking for bugs under flakes of bark. They chit-chit to each other, and chatter to themselves. Peck-peck with tiny beaks. Then chit, flit to another tree. I saw ravens and juncos too. These are resident winter birds. I continued up the hill. When exploring, one doesn’t know the exact location. No familiar landmarks. 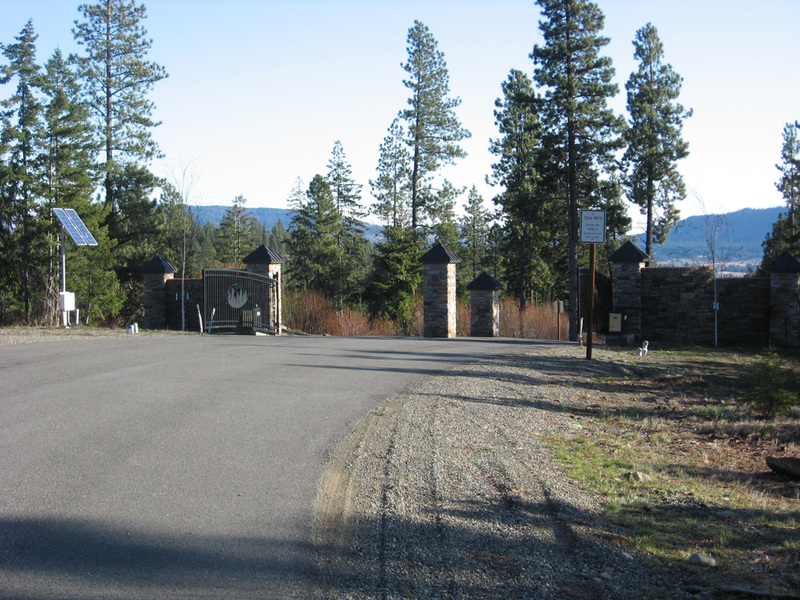 So when I popped out on a paved road, I saw this gate. Placed, I suppose, to keep out wandering riff-raff like me. Last summer I flew over this place when I took a recon flight to our wilderness fire, so I knew houses were being built up here. For whom, I wonder? No one talks about affordable houses for lowest-tier civil servants and young families just starting out. Where will the water come from? Where will the sewage go? Who will pay to plow the roads in the winter, and protect those homes from the inevitable forest fire? Development always causes these unanswerable questions to rise up in me. I walked through the gates and toward my truck. Not ready to go back yet, I detoured into the logged-over woods and sat on a stump with my face turned toward the sun. Listened and looked. Felt myself settle and breathe.